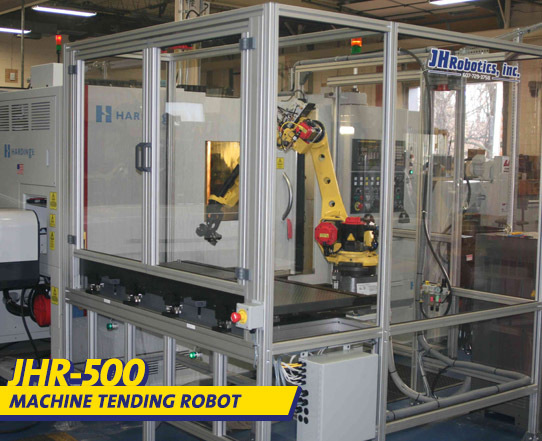 - Machine Tending Robots - JHR-500 - JH Robotics, Inc. This larger dual pallet front loader can handle parts loaded vertically or horizontally in pallets, with vertical arrangements offering larger part quantities per pallet. High part queue capability - potential for a complete 1 or 2 shift queue depending on cycle time. Continuous machining cycle w/ dual pallet input - operator can reload one pallet as robot continues to load/unload parts from the other pallet. Pallets are on slides and need to be removed only when changing pallets for another job. Easy access to machine tool through sliding door with machine tool controls always accessible, even when in automatic operation. Can be easily accommodated to load/unload virtually any machine tool – lathes, mill, grinders, EDMs, etc. Cells are designed and constructed to best suit the customer’s need, i.e. queue time, floor space, part size & weight versus robot model, various optional inputs, etc.